Safecoat MexeSeal is a low odor, waterbased, clear sealer. It is suitable for use on porous interior tile or masonry surfaces where oil and water repellency are desired. It is ideal for long term protection against food, oil and water stains on residential or commercial floors. Safecoat MexeSeal is non-hazardous and non-flammable - a total replacement for high solvent content systems. Available in gloss and satin sheens. USE ON - Safecoat MexeSeal is recommended on substrates such as unpolished marble, limestone, granite, sandstone, slate, fireclay (brick, tile, terra cotta, pavers), concrete (brick, tile, precast panels, cast in place). Always test in small, inconspicuous places before full application. Safecoat MexeSeal is generally not suited for polished surfaces. Not recommended for use on modern Saltillo or quarry tiles without special care. Saltillo or quarry tiles generally contain salts and other contaminants sensitive to application of water based products. White efflorescence flushing may occur. It may be necessary to repeatedly remove contamination and repeat MexeSeal application until all contaminants are extracted. APPLICATION - To assist in quick drying/curing, bring adequate ventilation and air flow to the work area. Before using, stir Safecoat® Mexeseal thoroughly but without excessive agitation so as to avoid air bubbles. Then apply as is, using a squeegee brush, roller, sponge or appropriate spray equipment. Apply in thin coats. Allow at least two hours to dry between coats. For best results, this product should not be reduced. Two or more coats may be needed depending on porosity of masonry product. Apply only to a completely dry substrate. Correct application will often slightly deepen color of existing surface. Note: these instructions are intended to be general only and not exhaustive. The applicator should determine which preparation and techniques are best suited to the specific surface. 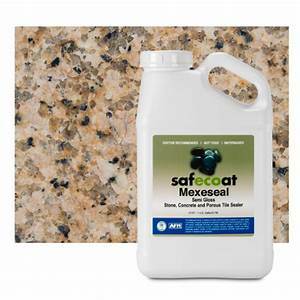 COVERAGE - One gallon of Safecoat MexeSeal covers approximately 300 square feet in one coat depending on surface porosity. DRYING/CURING TIME - Under normal conditions, Safecoat MexeSeal dries to touch in one hour, is recoatable after two hours and may be opened to traffic after 8-24 hours, depending upon conditions. Normal conditions include a clean, dry surface, access to fresh air flow, a dust free environment, moderate humidity, and temperatures above 55 degrees F. Thick application, high humidity or conditions other than normal will cause Safecoat MexeSeal to dry and cure more slowly.